There aren’t many football kits as recognisable as the black and blue stripes of the Nerazzurri. For the past two decades, Nike have been the masterminds behind Inter Milan’s growing catalogue of gorgeous kits, with many designs taking on a near-legendary status as the years have gone by. Those thick Nerazzurri stripes are recognised all over the world, injecting Inter with a bold identity to rival that of their bitter city rivals. But it’s certainly not all show and no substance, because the relationship between Nike and Inter has undoubtedly been a productive one. The Swoosh was first seen beside those famous stripes back in the 98/99, during a time when the Italian giants had the likes of Ronaldo and Christian Vieri leading the line. After winning 5 back-to-back Serie A titles, four Italian Cups and an unprecedented Champions League trophy, it’s fair to say that the Nike-Inter relationship is certainly one worth celebrating. And, that’s exactly what they’re doing with their 2018/19 football kit. Now available on high street shelves, the new Inter Milan home kit draws inspiration from one of the most iconic designs in the club’s history. The image of the serpent (Il Biscione) has become synonymous with Inter down the years, and this was a big feature of the popular 2010/11 strip, back when the Nerazzurri were reigning champions of Italy and Europe. After 7 long years, Il Biscione makes a grand return in both the 2018/19 home and away shirts. On the Inter home kit, it can be found in the form of an almost imperceptible snakeskin graphic within the thick black and blue stripes; while that same pattern is arguably much more noticeable across the front of the white away shirt. The end result is a pair of elegant football kits that not only pay homage to the traditions of the club, but also celebrate one of the most successful periods they’ve had with Nike. But the real celebration can be found in the gold Swoosh and outline to the club’s crest, which is a nod back to the year it all started for Nike and Inter. 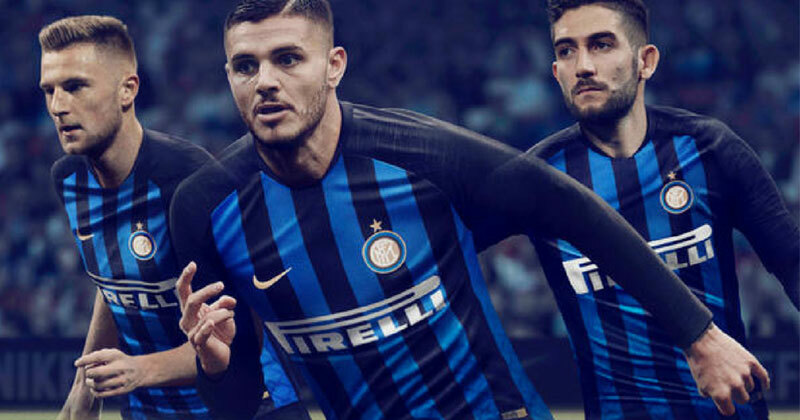 The 98/99 kit is famous for its gold outlines and thick Nerazzurri stripes, and fans are bound to be delighted to see both features make a return in Nike’s latest Inter football kits. In a summer that’s already seen the Italian giants do a bit of transfer shopping, the Nerazzurri will be hoping the latest generation of players can emulate the achievements of those two glorious seasons. These are hands-down two of the classiest Serie A football kits we’ve seen in a very long time- and are an essential addition to any Inter fan’s locker.